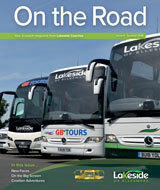 As a service to our customers, we have provided a link to GB Tours website. Our executive coaches operate all tours on Routes A/C/D/G/L/U/W/Y/X and some of Route B/E/F. Customers from the local area can be picked up at our depot by prior arrangement. GB tours provide a wide range of good value holiday tours, weekend breaks and day excursions. Stagecoach Tours: Based in Shrewsbury. Stagecoach have been using our services for 16 years. Stagecoach has a good mix of day excursions and holidays in the UK and on the continent. Gardeners’ Delight Escorted Trips: Based in Shrewsbury. This is our eleventh year with Gardeners’ Delight who offer escorted day and short break trips to National Trust properties; private gardens; garden shows; market towns, as well as other places of interest all over the UK. Many of the venues are difficult to reach by public transport. Wisteria Tours: Based in Shrewsbury. A love of gardens and gardening runs through generations of our family so taking groups of people to beautiful locations is a labour of love for us. Jacky and Sue are sisters, both living in the gorgeous county of Shrophire. Jacky, a Shrewsbury resident since 2007 has spent the last four years working with Gardener’s Delight, our sister company. As co-founder of Wisteria Tours she is busy creating wonderful tours to beautiful locations throughout the UK.